The history of the Phantom in UK service is what will be covered here; other web sites cover the basic aircraft in much detail and I see little point in duplicating that effort. The Royal Navy's initial plans in the 1960s were to replace their Sea Vixens with a supersonic VTOL type, the Hawker P.1154RN. This was a navalised variant of the P.1154 which the RAF wanted to replace their Hunters with. The RN wasn't entirely happy with this, and what they wanted - a two seat interceptor - differed somewhat from what the RAF wanted - a single seat ground attack/recce type. 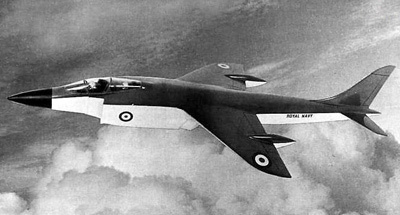 A design with a single engine and predicted service date of 1968 also worried the RN. 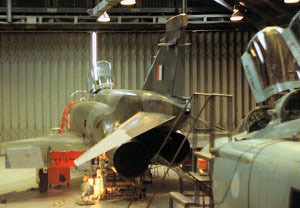 It was no mistake that McDonnell-Douglas popped into RNAS Yeovilton with their new F-4B in 1961 on the way back from the Paris air show; they also produced documents with titles such as 'F-4 in Royal Navy Service' and pushed the benefits of the aircraft - it was available right now, and it would be cheaper than the P.1154. Fast forward to 1964, and the P.1154RN was cancelled; the RN had made their mind up and wanted the F-4 instead. Later that year the new Labour government came to power and also cancelled the RAF's P.1154 and TSR.2, leaving the RAF with no Hunter replacement, and no Canberra replacement. Suddenly the F-4 was looking much more attractive. Biting the bullet and ordering the F-4, the MoD did at least get agreement to re-engine the aircraft with Rolls-Royce Speys, and to have parts of the aircraft built in the UK - e.g. BAC would build the rear fuselage, Ferranti would build the radars (though the American design would be kept). 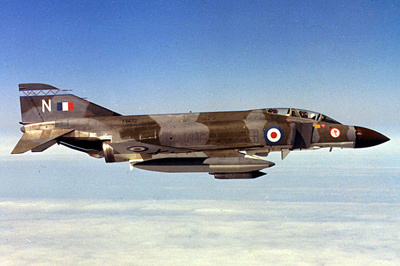 Based upon the F-4J, two UK versions of the Phantom II were produced. The Royal Navy was to receive the F-4K, and the RAF were to get the F-4M. The F-4K, the RN's carrier variant, needed to be made compatible with the RN's carriers, which were rather undersized in comparison with their US counterparts. The entire nose radome needed to fold 180 degrees in order to fit the aircraft onto the deck lifts; the nose leg needed to be extendable so that the aircraft could sit with the nose much higher at take-off in order to reduce the amount of wind needed over the deck at launch. Larger flaps, drooping ailerons and slatted tailplanes were also required to improve take-off performance. Thankfully some of these additions were already being introduced in the F-4J. The RAF, however, would have been quite happy with a standard F-4 and looked upon all the additions - including Speys - as being completely unnecessary, and using up valuable time and money that could have been used to finance a larger purchase. On paper, using Speys looked like a great idea, as they were more powerful than the J79s fitted normally, and more fuel-efficient. However, it would not be an easy match. The engine bays needed to be enlarged, and the rear fuselage redesigned to cope with the slight exhaust down-angle needed to further improve take-off performance. Speys required a greater flow of air so the intakes had to be enlarged and even then auxiliary intake doors had to be introduced on the fuselage just forward of the tail. All of this work took so much money and time that the supposed off-the-shelf cheap buy was turning into a protracted and expensive procurement. The benefits of greater thrust and fuel economy were also practically negated by the higher drag caused by the enlarged fuselage. 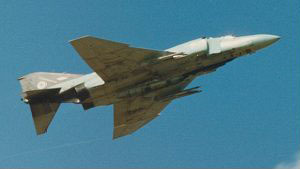 Acceleration at low altitude was improved; however at high altitude the F-4J performed better. Happily for the pilots of UK F-4s, the Speys were significantly less smoky than the J79s, so a British F-4 was at least trickier to acquire visually! 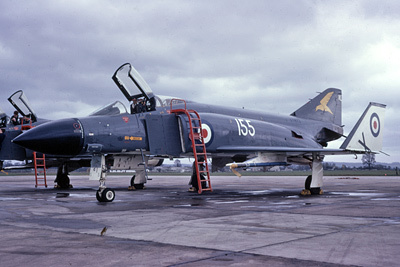 The first three F-4Ks (or FG.1s as they were designated by the UK) were delivered to RNAS Yeovilton in Somerset in April 1968 and these formed No.700P Intensive Flying Trials Unit along with three more examples delivered later. In January of the next year trials had progressed far enough for the FAA to be able to form a training unit, and so 767 NAS was commissioned. With only 28 FG.1s available to the Navy, there would only be enough for a single front line squadron in addition to the training squadron and trials unit. 892 NAS, formed in March, would therefore be the Navy's only front-line Phantom operator. While 892 worked up, 700P underwent carrier trials on HMS Eagle and the USS Saratoga, a traumatic experience for the American carrier which suffered burnt and buckled deck plating from the higher thrust of the Spey engines. Eagle and Ark Royal would need water-cooled blast deflectors and deck plates and in the event only the Ark received this upgrade. The new type's first public appearance was made by a 700P example at the 1968 Farnborough show where the massive thrust of its Speys certainly made an impression on the crowd. Unfortunately for the Royal Navy, their plans of operating 140 Phantoms on HMS Ark Royal, HMS Eagle and the new super-carrier CVA-01 were dealt a massive blow when the government cancelled the new carrier, and the plans for refurbishing existing carriers. Only Ark Royal would be modernised and the order for F-4Ks was cut again and again until only 48 examples were ordered - and 20 of these were diverted to the RAF! The RAF were also receiving their first Phantoms, the examples diverted from the RN's order. In fact some of the 767 NAS FG.1s were delivered in RAF camouflage instead of Navy markings as they were intended to move to RAF use so soon. 892 knew this too and suspecting they would be the last fixed-wing type to equip the FAA (proved wrong in 1980 with the introduction of the Sea Harrier), their squadron marking was a large Omega symbol on a white diamond placed on a red fin flash. So, procured for the worst of reasons but perhaps with the best intentions, the Phantom entered service with the RN and RAF. Prompting one admiral to ask if it had been delivered upside-down, the aircraft could never be described as a looker and in fact one of its nicknames was "Double Ugly"! HMS Eagle saw a brief period of Phantom trial operations in the English Channel, but most FAA Phantom flying was initially from their home base at Yeovilton with detachments to RAE Bedford and its dummy carrier deck facilities. 892 gained their 15 minutes of fame when one of their Phantoms won the Daily Mail's Transatlantic Air Race in May 1969 (commemorating the 50th anniversary of Alcock and Brown's crossing of the Atlantic). In the process they set a record for flight time from New York to London - 4 hours 46 minutes and 57 seconds. Once HMS Ark Royal was ready in 1970, Phantoms from 892 NAS were embarked and serious operations could begin, with jets from 767 also using the carrier for practice. 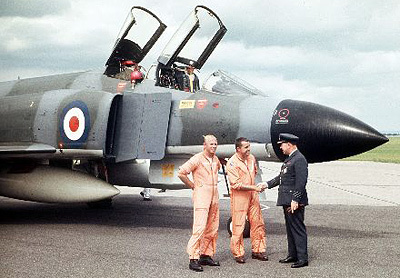 All too soon though 767 was disbanded - with the Phantom training task passing to the RAF in 1972. RN Phantoms moved in this year too, from RNAS Yeovilton to RAF Leuchars. 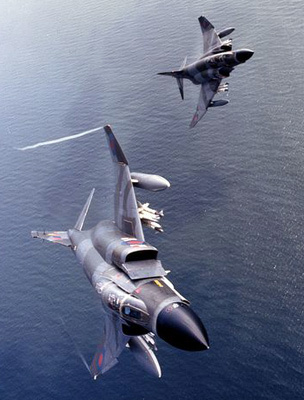 The RAF, meanwhile, had been busy forming a number of Phantom squadrons. RAF Coningsby was to be home for the greatest number of them - 228 OCU was first, forming in August 1968. Following them, 6 Squadron in May 1969, 54 Squadron in September 1969 and 41 Squadron in April 1972. Leuchars saw a single squadron - 43 - being formed in September 1969. RAF Bruggen in Germany saw the formation of 14 and 17 Squadrons in July 1970, 2 Squadron in December 1970 and 31 Squadron in July 1971. While the RAF Germany F-4s were only minutes away from the Soviet border, Lightnings continued to guard the frontier, and the RAFG Phantoms were tasked with ground attack and interdiction as well as reconaissance. The 'R' in 'FGR.2' was really a bit of a misnomer, as only 30 or so Phantoms were actually equipped with the wiring necessary to use the big EMI recce pods. While 2 Squadron worked up, the Hunter FR.10s they were previously equipped with were, unusually, kept in service - so effectively there were two seperate 2 Squadrons in operation! This sort of thing soon became common in order that the strength of the NATO-declared RAF forces in Germany never diminished while new equipment (particularly the later Jaguar) was introduced. 43 Squadron up at RAF Leuchars had much longer flight times to deal with than the RAFG squadrons. 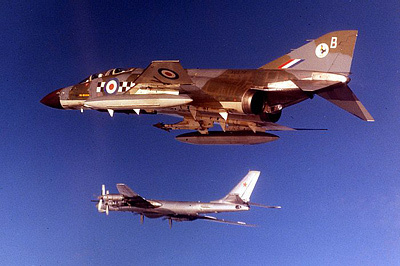 The Phantom was better suited to long-range interceptions over the North Sea than the then-prevalent Lightnings, and 43 Squadron's birds were soon regularly intercepting Soviet intruders (in cooperation with Shackletons and RN Gannets from Lossiemouth) and preparing the way for the gradual phase-out of the Lightning in this role. 43 Squadron were joined by the Phantom Training Flight, also using FG.1s diverted from the RN Phantom order. While the FAA's operations very gradually ran down, RAF squadrons continued to be formed, with 19, 23, 29, 56, 92 and 111 Squadrons joining the fun between 1973 and 1976, the height of UK Phantom operations. With increasing recognition that the Phantom was much better suited than the Lightning to defending the UK's airspace and the surprise success of the Jaguar programme, RAF Germany in particular began to lose its Phantoms, which were re-tasked with air defence while Jaguars took over the ground attack and recce roles. Revenge of a sort was had when one Phantom shot down a Jaguar over Germany - it was, of course, an accident. So the story goes, anyway! Moving swiftly on... several Phantom squadrons converted to Jaguars - 6, 14, 17, 31, 41 and 54 all disbanding and reforming with Jags between 1974 and 1977. 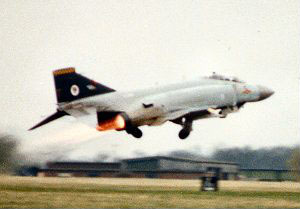 RAF Coningsby had always been the primary RAF Phantom station, and most of the newer squadrons had been formed there. While the Jaguars had ended Coltishall's days as a Lightning station, the Phantom put paid to its days at Wattisham also, leaving only Leuchars and Binbrook operating English Electric's finest. Even then its days at Leuchars were numbered and with 23 Squadron's reformation as a Phantom squadron, the Lightning was to be found only at Binbrook, where it filled a gap left by the still- insufficient number of Phantoms. Therefore, the government's cost-cutting in the 1960s ensured the Lightning soldiered on longer that it really should have done - every cloud has a silver lining! 1978 saw the final withdrawal of the RN's Phantoms, with HMS Ark Royal paying off, destined for the scrapyard. 892's FG.1s remained at Leuchars but passed to RAF charge with 111 Squadron who passed their FGR.2s onto other squadrons. Settling down to their tasking of UK air defence, the RAF's claims to be able to defend the RN fleet were soon to be proved to be a nonsense when in 1982 the Argentines invaded the Falkland Islands, a British territory in the South Atlantic. With Ark Royal already reduced to saucepans, there was no way to intervene until the RN's smaller 'Harrier carriers' reached the area, and RAF Phantoms (a small detachment from 29 Squadron) were limited to defending the staging post at Ascension Island, lacking the range to cover the huge distances involved. The folly of the the retirement of the RN's big carriers would soon cost lives, and perhaps more importantly for the bean counters in government, it would cost them several big expensive ships. With Britain's victory in the Falklands, the airstrip at Port Stanley - the islands' capital - was upgraded to enable temporary Phantom operations while a serious station - RAF Mount Pleasant - was being constructed. 23 Squadron moved from Wattisham to Stanley in March 1983, taking over from the 29 Squadron detachment. This left a gaping hole in the UK's own air defence and adding to that delays in the Tornado ADV programme and the unexpectedly high amounts of fatigue life expended by the RAF's Phantoms when used in the ground attack role, the MoD soon realised it was in desperate need of some more aircraft. In the usual "You couldn't make it up" style of procurement, the RAF ended up buying some more Phantoms - off-the-shelf F-4Js recently retired by the US Navy! After all the fuss of producing UK specific versions, the best performing UK-operated Phantoms would turn out to be more or less stock F-4Js with only minor modifications made. They even had improved J79 engines, reducing the famous Phantom smoke trail to levels similar to those of the Spey-equipped F-4Ks and F-4Ms. Designated as F.3s, this didn't really catch on and they were more usually referred to simply as F-4J(UK)s.
In 1986 23 Squadron once again to the new station of RAF Mount Pleasant, but by 1988 had been reduced to a flight of only four aircraft (and redesignated as 1435 Flight) in anticipation of immiment replacement by Tornado ADVs. Binbrook's Lightnings were also retired and replaced by Tornados. In 1989, 43 Squadron disbanded, re-equipping with the Tornado F.2, and 111 Squadron went the same way in 1990. By 1990 some of the F-4Js were becoming increasingly tired and several had been grounded to be robbed for spares, and it was decided to retire them as quickly as possible, replacing them with FGR.2s from the squadrons that had disbanded. In the middle of all this, however, Saddam Hussein invaded Kuwait and RAF Phantoms had their second chance of some action. Unfortunately for the Phantom force, they were relegated to guarding Cyprus - an important tasking, but lacking any opportunity to bag some bad guys. The Tornado force, it seemed, had been given the juicier deployment to Saudi Arabia. Of course, they never bagged any bad guys either, so the new boys never had a chance to rag the Phantom squadrons about it! By 1991 the UK Phantom force had been reduced to four squadrons, all based at RAF Wattisham. 92 Squadron disbanded in July; 19 Squadron disbanded in January 1992. 56 Squadron were next, in June. With only 74 Squadron left, the outskirts of Wattisham were scattered with retired aircraft, many marked with a blue cross to let the satellites of the former Soviet Union verify that the aircraft were out of use. The end of an era was marked on 1st October 1992, when 74 Squadron performed their final formation flypast, and Wattisham fell silent. 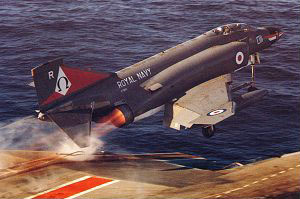 There would, sadly, be one final chapter in the UK Phantom story, and it is not a happy ending. Ludicrously despite being partly manufactured by UK firms, and bought with UK taxpayer's money, the USA had stipulated that the aircraft could not be disposed of to non-government organisations. Thus an important part of the UK's aviation history has for the most part been reduced to scrap despite museums across the country crying out for a chance to exhibit an example of this powerful aircraft. A few have somehow escaped the bureaucratic edicts from above, but it is a small number. Most that were not immediately scrapped on retirement have succumbed to the scrapman's attentions in the years since, the final mean-spirited act in the story of the UK's Phantoms. Production totals for the F.3 variant are only for those F-4Js converted ot F-4J(UK) standard - many more F-4Js were built. Corrections and gap-filling welcome as always!